The intimus 32 CC3 cross cut shredder is a top tier desk side shredder available in the market. The paper shredder has the ability of handling about 14 sheets at an impressive rate of 9.8 ft/min and achieves the security level of 3 (P-4) by creating cross cut particles of 5/32” x 1 1/8”. With a feed opening of 9” the paper shredder can handle a large variety of documents commonly used in an office. The high quality cutting blades incorporated in Intimus 32 CC3 cross cut shredder have the ability of cutting through staples, paper clips, credit cards, and DVDs quite easily. The waste-bin attached with the shredder has a transparent window that can be used to check the shred volume remaining. The smartly designed paper shredder also features a separate feed opening for DVDs and a separate compartment in the waste bin to store plastic waste. For safety and convenience of the users, the Intimus 32 CC3 comes equipped with various features that make if stand out from other desk side shredder available in the market. With its Silentec technology, the paper shredder operates in a virtually silent environment, which makes it a perfect choice for shared workspaces. 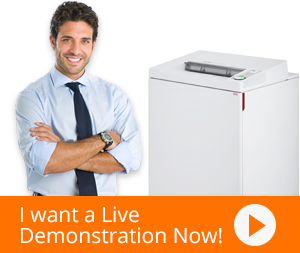 The patented i-control’ and Eco-logic features make the shredder easier to control and environment-friendly. To prevent any kind of accidents during operation, the paper shredder comes equipped with electronic sensors that automatically stop the machine when fingers come in close proximity of feed opening. The Intimus 32 CC3 comes packed in an aesthetically designed casing that can be placed anywhere in an office, thereby cementing its position as a top quality personal shredder. Q. What is the security level of Intimus 32 CC3 Cross Cut Shredder? A. It has a security level 3 (P-4). Q. How many sheets can Intimus 32 CC3 Cross Cut Shredder shred at a time? A. Intimus 32 CC3 Cross Cut Shredder can shred 10-12 sheets at a time. A. Yes, a warranty of 2 years is provided on all parts. Q. How strong are Intimus 32 CC3 Cross Cut Shredder’s cutters? A. The shredder’s cutters can easily shred paper, paper clips, credit cards and staples. Q. Can Intimus 32 CC3 Cross Cut Shredder be moved around conveniently moved around the office? A. Yes, the shredder is maneuverable as it weighs only 37 lbs.